More than one third of the world’s population is currently affected by dental cavities, also known as “caries”. In many countries where running water is not abundant, people experience even higher amounts of tooth decay; because proper oral hygiene must be consistently practiced in order to prevent its’ formation. Once dental caries have begun to form, harmful acids will continue to erode your tooth, potentially causing pain and sensitivity when eating and drinking. Fortunately, there are excellent treatments available to restore you teeth and prevent further damage. It is estimated that almost all adults will have a dental cavity at some point in their lives. Children are at a greater risk for developing tooth decay because they are typically unable to properly care for their teeth alone. If not taught good hygiene at an early age, these bad habits can carry into adulthood. 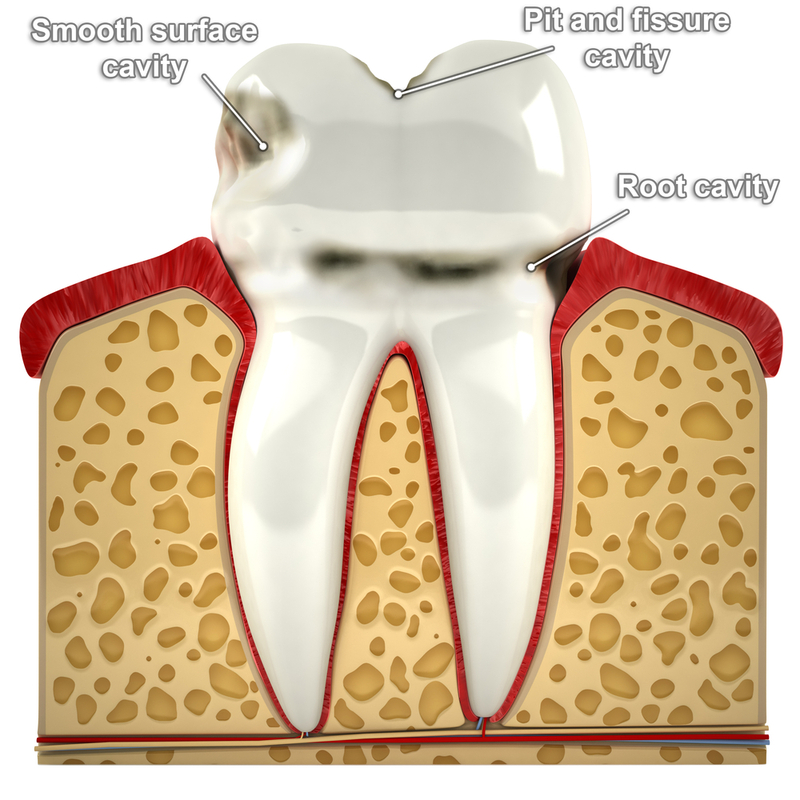 In later years, you may experience decay in your tooth roots, known as “root caries”. This can occur when your gums begin to recede due to gum disease and abrasion. Exposed root is highly susceptible to tooth decay because it does not have a protective enamel layer. It is common knowledge that you must take good care of your teeth in order for them to last a lifetime. However, even occasional poor hygiene practices can take a toll on your oral health. Every time you skip brushing your teeth, the bacteria in your mouth begin to multiply by feeding on leftover food particles. As they breakdown this food, they release a harmful acid onto your tooth surfaces. If allowed to remain for too long, the acid will begin to erode your tooth enamel, dentin, and cementum, causing a hole to form in your tooth (cavity). When this is the case, usually a filling will be necessary to remove infection and restore your tooth. With over 25 years of professional experience, Dr. Steven M. Huffstutler and his caring team proudly provide exceptional preventive, cosmetic, and restorative dental treatment to patients and their families. Our patients come from across Dallas/Ft. Worth, including North Richland Hills, Denton, the Mid-cities, Southlake, and all surrounding communities. We also have extensive experience helping patients find relief from painful TMJ disorders (various forms of jaw dysfunction). To schedule an appointment with Dr. Huffstutler, contact our office today by calling 817-577-1444.